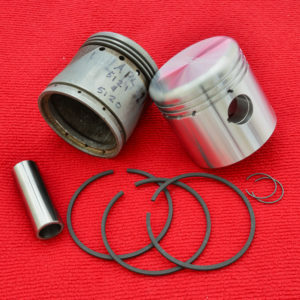 Following on from the successful production of pistons for OHV 500cc Sunbeam models Chris Odling and I thought it would be useful to produce some high-quality forged pistons suitable for the Model 6 side valve long-stroke. The Model 6 was produced from 1922 until 1939 becoming known as the Lion after takeover by ICI. With its 77mm x 105.5mm bore and stroke this was the last side valve powered motorcycle to win a Senior TT. There were of course changes along the way and the piston produced is nominally compatible with models produced from 1925 until 1929. Before 1925 a 5/8″ gudgeon pin was used rather than the later 7/8″ type and the change to a scavenge pump from total loss oiling in 1930 means a different piston ring configuration is required. It is possible that these pistons could be adapted to suit. I have limited availability of pistons in 77.0mm +0.000″ and +0.040″ sizes. An all-up weight of 434g has been achieved for the 77.0mm which is within 2g of the target weight that we set out to achieve. Once we have given the new items a good look-over I’ll be contacting those who have reserved pistons already and adding them to the Sunbeamland shop. This entry was posted in Shop and tagged for sale, Lion, Long stroke, longstroke, Model 6, piston, spares, Sunbeam by Dodson. Bookmark the permalink. Yes, I have a few left in +0.000″ and +0.040″ if you have a look in the shop there is a data sheet.